What is Kata?⎮How is it different than Lean? Kata is a method of making small, incremental change toward improvements every day. Originating in martial arts, Kata are structured routines consisting of patterns. Practicing kata (patterns) consistently and deliberately forms a habit. Forming a habit develops new skills. With new skills comes increased confidence in one's abilities to recognize and make small improvements that keep a person (or a process) in top form continuously. As simple as it sounds, Kata involves deliberate, repetitive practice to master. In martial arts, kata is choreographed patterns of movement that are practiced until mastery of a single form is achieved. The practice is applied again and again to learn and eventually master each small set of movements. In manufacturing, kata describes the true continuous improvement philosophy and culture exemplified by Toyota. By implementing Kata, your organization can develop the habit and skills to shift individual mindsets and the corporate culture toward truly continuous improvement that keeps processes efficient, customers happy, and companies profitable. “Toyota Kata” is the term that Mike Rother (internationally recognized Lean guru and author of Learning to See) coined to help American manufacturers mirror Toyota’s successful practices of true continuous improvement. Past observations of Toyota’s operations educated American manufacturers on the innovative company’s methods for improving process efficiency and eliminating waste (the traditional “Lean Tools”). Decades later, however, the same observers were shocked that when they observed the same Toyota operations, they now saw different solutions to the same processes. Rather than implementing a one-time “Lean Tool” solution, Toyota had continued to adapt, improving their processes over time. This culture of true continuous improvement is what keeps Toyota at the forefront of manufacturing excellence. Kata enables improving every process every day. It’s not limited to management or customer-facing employees. 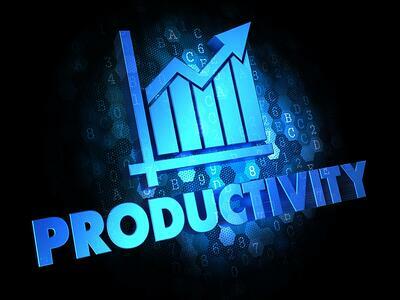 Every employee from top management to janitors is expected to encourage daily improvements through their own actions. Practicing kata will develop a habit that, over time, changes behavior, which ultimately changes culture. In Kata, it is everyone’s responsibility to encourage daily improvements through their actions. Anyone who wants to develop the habit and skills of continuously improving daily actions can use Kata. Various manufacturing industries utilize the Kata methodology. Although Toyota Kata was developed to emulate Toyota’s Manufacturing culture, like the Lean Tools, it easily adapts to non-manufacturing industries. The Healthcare industry quickly embraced and has advanced using the Kata methodology. Agile Software Development can also use Kata for Agile Retrospectives. The opportunity exists to deploy Kata for startup businesses to drive progress and accountability. WHat type of process will kata work on? Can I start Kata myself? Kata is not something that can just be implemented. 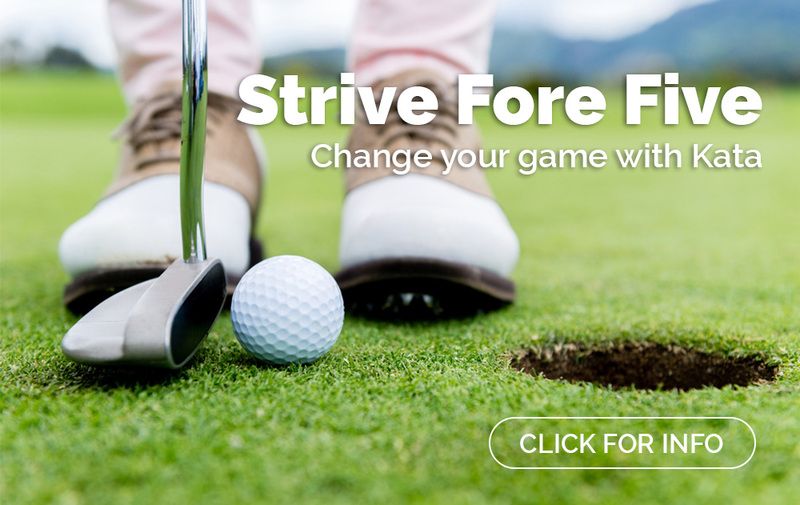 It’s a structured foundation of changing behavior that requires training and practice to ensure success. Because of the broad range of support and resources needed for implementation, Lean programs are typically started with the help of an outside catalyst (consultant) guiding the organization down the correct path. Similarly, guidance from an experienced Kata Coach is highly recommended to train the first rounds of deployment with a core team who will become the Advanced Kata Team for the site. With proper training, guidance, and practice, this Advanced Kata Team will develop into the future Kata Coaches that will coach and encourage the Kata culture throughout the organization. How is Kata different than Lean? 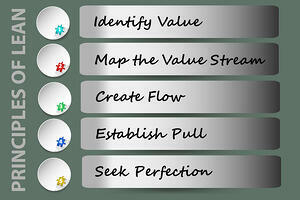 “Lean” is made up of continuous improvement tools such as Value Stream Mapping, 5S, TPM, Standard Work, Kanban, and so on. Kata is a methodology rather than a tool. It is developing the habit and skills of making small, incremental changes regularly. As we implement the Improvement Kata (IK), an identified solution could be deploying an appropriate Lean Tools when needed. The Kata methodology consists of the Improvement Kata (IK) and the Coaching Kata (CK). The Kata is carried out by a Learner and a Coach. Each Learner has a structured Storyboard to encourage dialog between the Leaner and the Coach. Improvement Kata is a four-step model of scientific method of thinking. Improvement Kata is carried out by the Learner (mentee) who will conduct experiments to develop solutions. Coaching Kata is coaching the problem solving of the Improvement Kata (IK) to ensure the Learner is following the scientific method during the Improvement Kata process. The person who carries out this role is called the Coach (mentor). The Coaching Kata is comprised of five questions meant to guide improvements towards the target condition. What is the current state of the process? What obstacles are you working on now which prevent us from reaching the target? What is your next step? (PDCA cycle)? When we can see the result of this step? 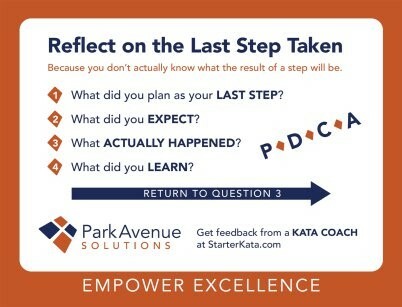 The Coaching Kata Card below is a helpful tool for Kata Coaches. The card provides the framework for the Kata Coaching Cycles. Click the button below to download a PDF with 4 printable Coaching Kata cards per page. Challenge = A vision. This can be 6 months to 3-year goal. Current Condition = Where we currently are with our process. Record as many facts and metrics to capture this condition. Target Condition = the desired condition of a process we strive to achieve in 1 -4 weeks. By establishing a target condition it results in measurable results faster than random improvements. Obstacles = what is preventing us from being at the Target Condition right now. Experiment cycles will focus on one Obstacle at a time. 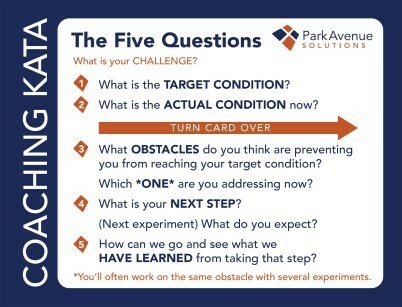 Experiment Cycles = is problem solving utilizing Plan-Do-Check-Act (PDCA) cycle. 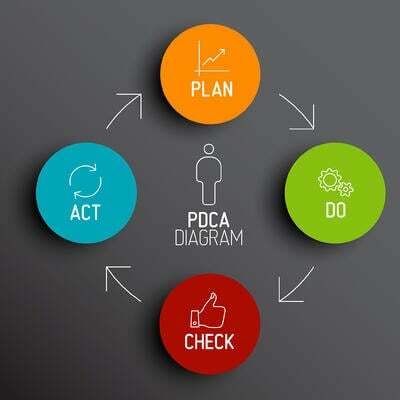 PDCA is based on the principle of experimentation and learning. An experiment is planned (Plan), implemented (Do), and when the results are positive (Check) the results are documented in standard work (Act). Try Starter Kata: Starter Kata are structured routines that you practice deliberately, especially at the beginning, so their pattern becomes a habit and leaves you with new abilities. Your first implementation of Improvement Kata can be your "Starter Kata" routine that will help your team learn fundamental skills. Practicing Starter Kata increases the speed of learning and is particularly helpful when you want to create a shared way of thinking and acting in a group of people, because everyone starts with the same basics. Download the Starter Kata Kit by filling out the form on this page. Get Feedback from a Kata Coach: Schedule a call with a Kata Coach (free 30-minute consultation).